They say that Europe is one of the richest continents in the whole wide world and they’re absolutely right. But we all know which countries carry the beauty and extravagance on their backs. They’re, of course, Spain and Portugal – the jewels of the Old World that cannot help it but marvel everyone who sets their foot on their breath-taking coasts. What are the first things that come to your mind when you think of these two? Surely, you think of bulls, castles, hot weather, delicious pastries that go with the unique wine. However, the first thing that connects these two wonderful countries is the golden sand sprinkled by the oceans and seas. The beautiful beaches in Spain and Portugal, my friends. They are the most precious landmark and a true wonder that wows every tourist. With hundreds of miles of coastline, the beautiful beaches in Spain and Portugal offer an unforgettable summer experience. Visitors can opt for sunbathing and swimming on urban, modern beaches vibrating with tourists full of wanderlust or they can go to the isolated kingdoms of silky sand. In any case, the fun under the sun is guaranteed. There are beaches for everyone’s taste, ranging from the ones for lovers of dangerous sports and wave action to romantic getaway types and perfect sanctuaries for the family travels. You just have to relax in the smooth surface of the water and let iodine fill your lungs. Awesome, right? What is more, the beautiful beaches in Spain and Portugal are the keepers of travellers’ best moments and memories as each of them has its original way to grow close to the people’s hearts and make them regret the end of their holidays. That is a reason more for turning these two countries into attractive tourism hotspots and increasing the number of beaches. Did you know that around 85 percent of all visitors pick the coast for their holiday destination and that means more days spent under the magnificent parasols and lounges? All of that led to rewarding these beaches with the Blue Flag by the Foundation for Environmental Education (FEE) for safety, environmental education, and water quality. There’s no better proof of their greatness and beauty than that. Let us not forget the nightlife, too. 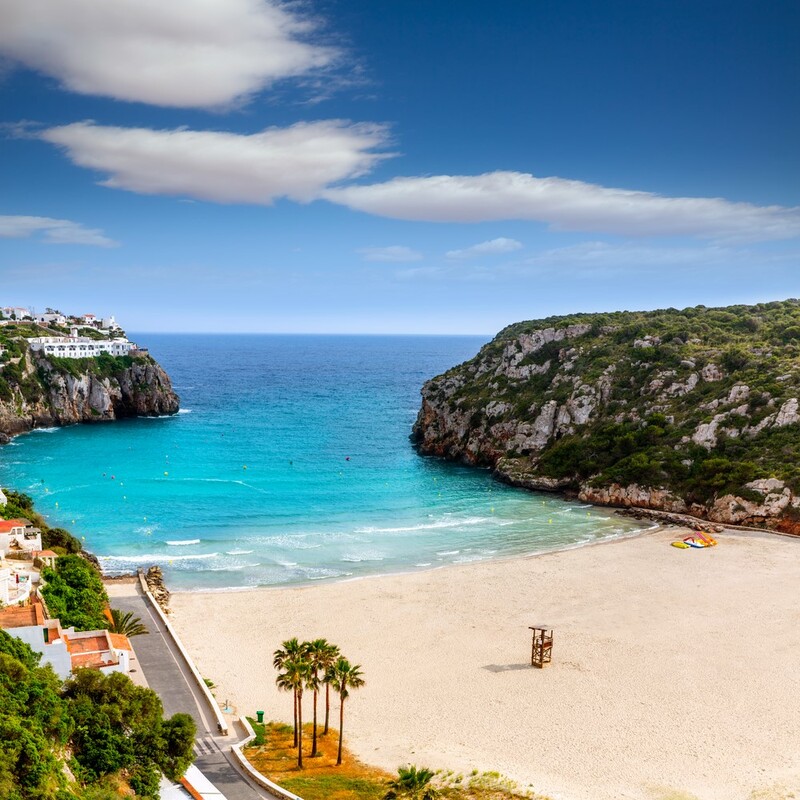 The beautiful beaches in Spain and Portugal are known for popular nighttime parties on the sand for those who are there for more than making sand castles and snorkelling. Having heard this, I know that it can be quite a struggle to decide which of these beaches to visit. But worry no more as we have just the beaches for you. Start the drumroll as we begin with the ultimate guide to the most beautiful beaches in Spain and Portugal waiting for you. 1. 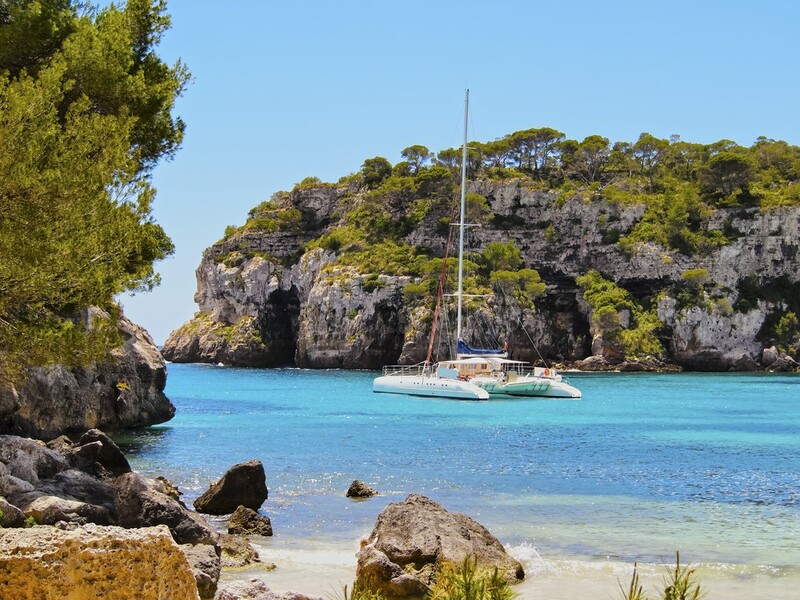 Menorca, Spain – Even though, many think of Menorca as a place for family holidays, it is so more than that. With the unspoilt nature and spectacular, beautiful beaches in Spain by the coast, it’s a perfect getaway for adventure hunters. There are completely deserted coves and seas so transparent that you can see the wildlife below the surface. Take a picnic, enjoy the travel or even go hiking to get the most of this paradise on Earth. You can check out some hotels nearby here. 2. Cala En Porter beach in Menorca, Spain – Located in a village on the Menorca island, this beach is situated on the south coast. It’s hugged by cliffs that form the cala, giving it a feeling of mystery and thrill. If you’re a car guy, there are a lot of free parking spots and for a whole day stay the beach provides sunbeds and parasols, which are all available for hire. They and the few bars and souvenir shops make this a very friendly and unforgettable spot among all the beautiful beaches in Spain. 3. 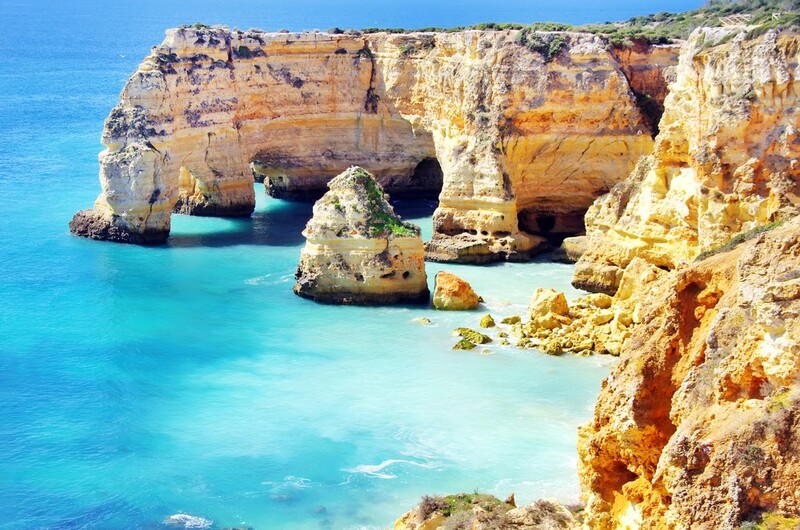 Praia da Marinha in Portugal – If you are looking for a crowd-free beach on the Algarve coast of Portugal, then this beautiful beach is the right thing for you. Once you get to it, you’ll feel like you have found a hidden gem between the cliffs that will light the climbing spirit in you. And to think of the marvellous view of the neighbouring caves. Simply remarkable. Together with the golden sand and picnic areas, it is a must-see place you won’t regret visiting. 4. 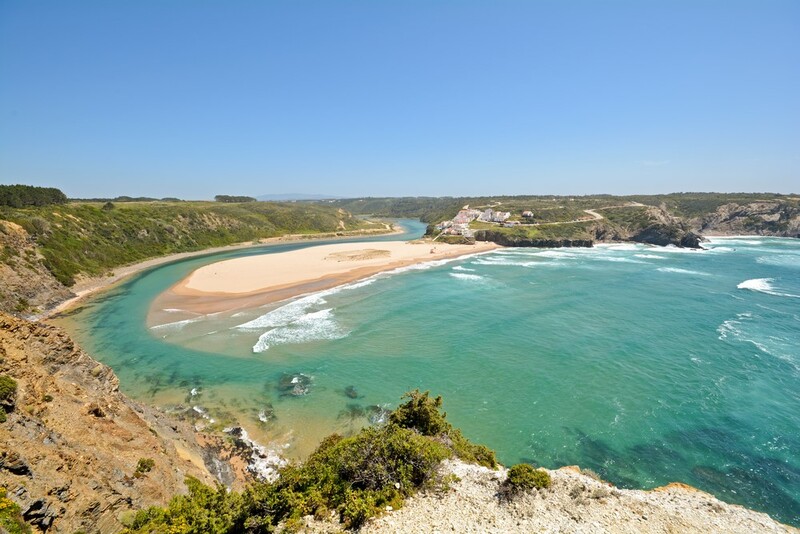 Praia da Falesia, Portugal – Rewind and forget about all the troubles in your city life on one of the longest beaches in Portugal. 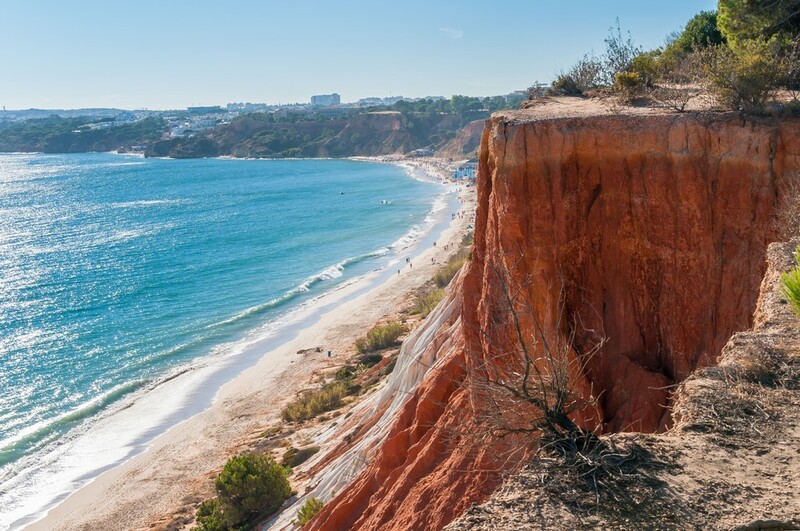 Praia da Falesia can brag with being a peaceful corner of the Algarve with a laid-back atmosphere, golf courses and a number of accommodation complexes with a lot of restaurants and bars. Its uniqueness is depicted through the preserving of the traditional Portuguese lifestyle. 5. 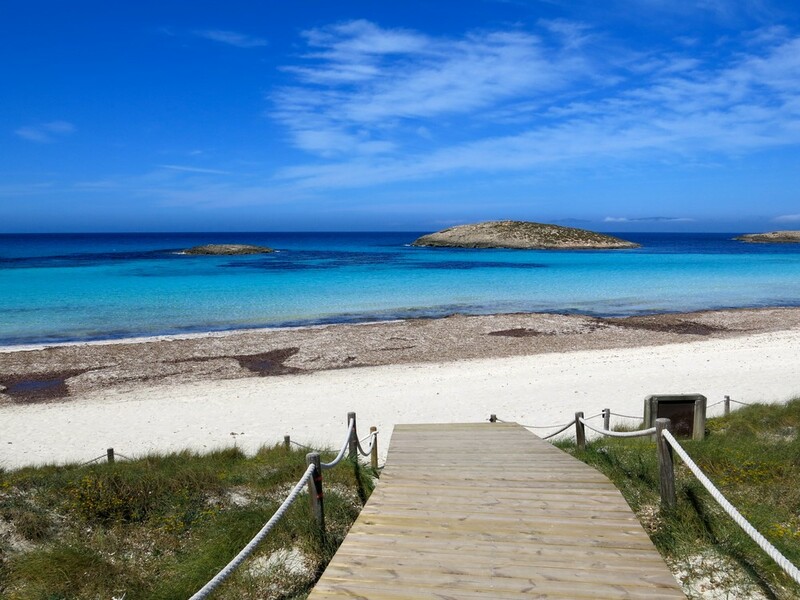 Playa de Ses Illetes, Formentera, Spain – Travel to the most popular beach out of all beautiful beaches in Spain located in a conservation area and make your time there worthwhile. Starting from the vast sand dunes and endless areas of soft sand enriched with flat rocks to the water-sports outlets and restaurants, this is the place to be if you’re searching for a natural phenomenon. What makes it even better is the opportunity to sail from there to the nearby island of Isla de Espalmador. 7. 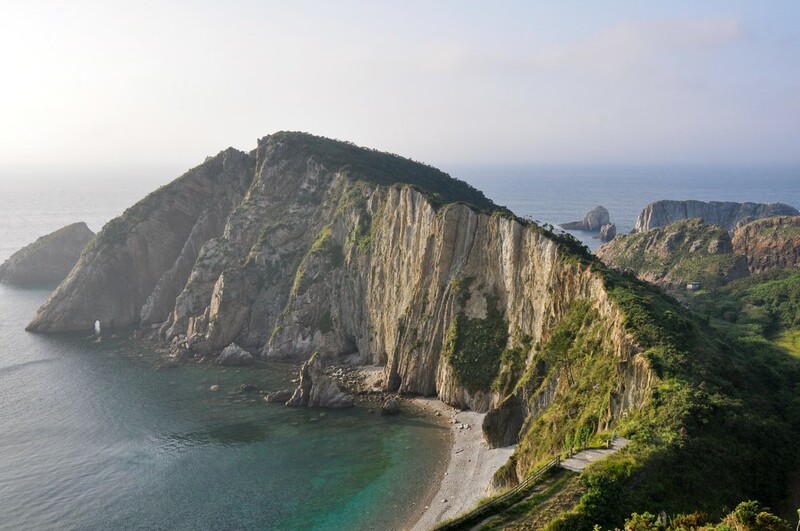 Beach of Silence (Playa del Silencio), Asturias, Spain – The name is a bit creepy, I’ll give you that. But this is undoubtedly one of the most beautiful beaches in Spain. The natural rock amphitheatre and the silver, sandy cove are guilty of that. Maybe it isn’t good for swimming, because of the underwater rocks, yet it’s great for some sun-soaking or taking cosy walks. Definitely worth a visit and your travel expenses. 8. Sintra-Cascais Beach, Praia da Adraga, Portugal – Beautiful beaches in Spain? 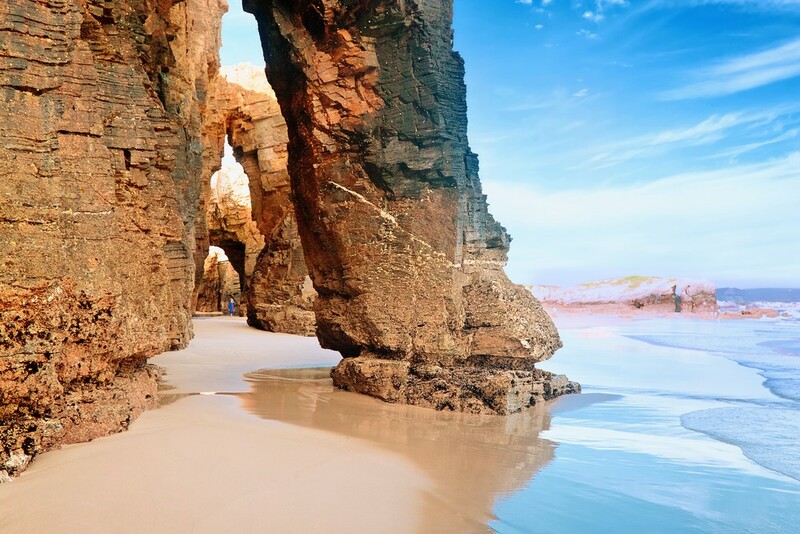 Wait until you see this semi-remote beach in Portugal that is voted one of Europe’s top 20 beaches by a British national newspaper. And that pretty much sums it all up, doesn’t it? The stunning scenery of golden sand and jagged rocks that can’t be seen almost anywhere else contributes to the beach’s reputation. Travel there to experience the ocean’s power as there are times when the ocean goes crazy with very big waves. 9. Praia de Odeceixe, Portugal – This is known as a haven for surfing guys and hippies during the summer, but there’s definitely more to it than what meets the eye. It is a glorious beach that offers a stroll beside the river and is packed with houses on a few hills. That makes it a rather peaceful and relaxed place in Portugal. The fauna is superb, the weather even nicer and the ocean side glamorous. All in all, it’s worth every dime. 10. Playa Cala Salada, Spain – If you didn’t have the chance to gaze at the wonderful shades of turquoise, now is a perfect time. The water encircled by hills of pine forests is impeccably clear for swimming and having the time of your life. The picturesque stone tower and boathouses built into the rock are one-of-a-kind landmarks. You can also dive into the past with the cave paintings dating back to the Bronze Age. And be careful, as no tourist ferries ever go there. That’s why these beautiful beaches in Spain might be too private for you. 11. 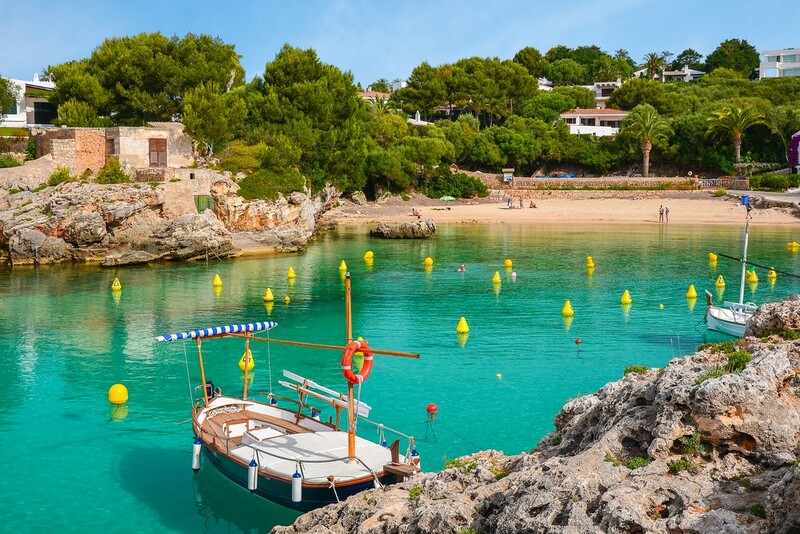 Cala Mondrago, Mallorca, Spain – This member of the club of beautiful beaches in Spain has a plethora of everything – pine forests, rocky coves and sand dunes that simply take the breath away. 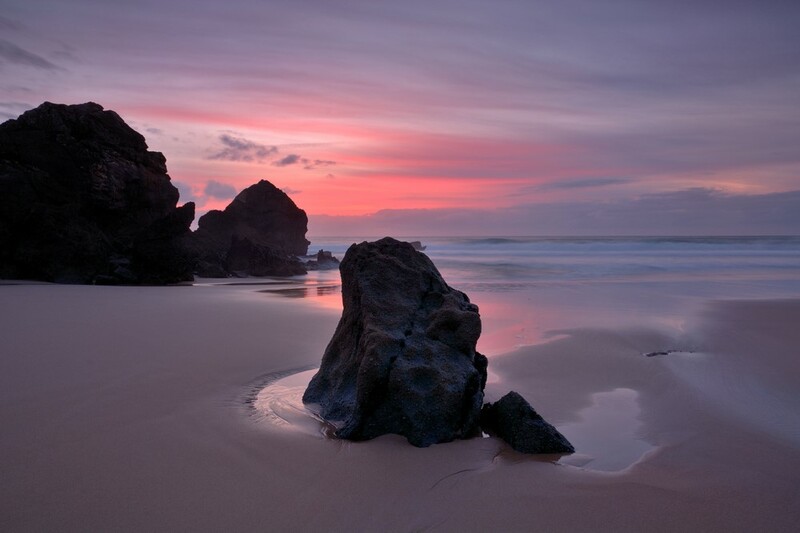 As it is a part of the Mondrago National Park, it is a Blue Flag beach with soft and silky sand. It’s very suitable for small children with snorkelling being an enjoyable activity due to the clarity of the water. And if you’re a fan of walking, the nature park provides numerous trails. 12. 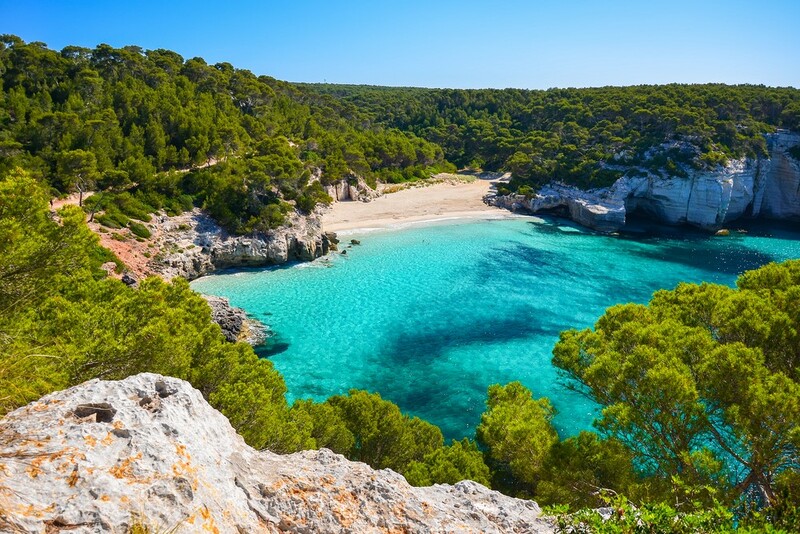 Cala Macarella, Menorca, Spain – One of the most beautiful beaches in Spain is located on the south-west coast of Menorca. 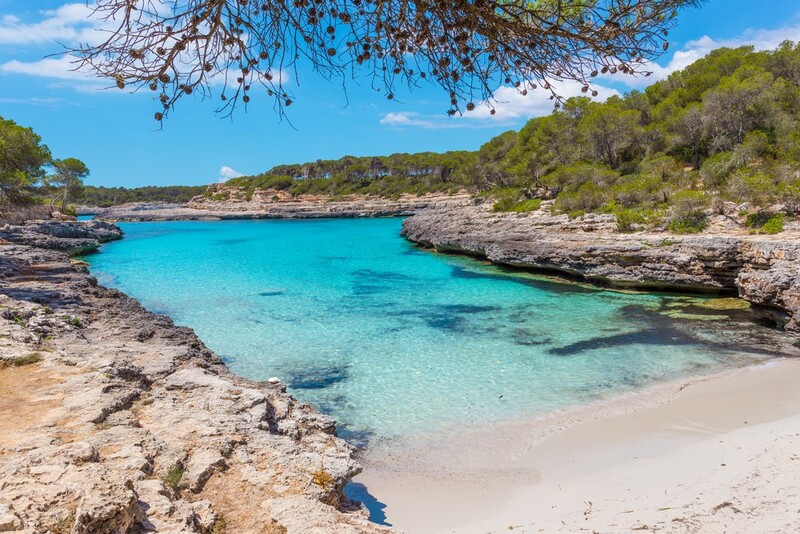 The Cala Macarella beach is a very exciting place mainly because of the calm turquoise water and the white sand that is smooth beneath your feet. The whole place is covered with pine trees sheltering the cove and giving a pleasing shade as an escape from the heating sun. You mustn’t miss the extraordinary swim and the perfect body tan that will spark envy in your friends back home. I lived in Spain for a year, only 2 hours to Southern Portugal, and sadly I have never been to ANY of these! I guess I need to go back and spend another year there! I do agree that the Balearic Islands (Spain) and Algarve (Portugal) do have the BEST beaches in the world though! I’m so glad to hear that, Lyssie. Spain and Portugal are truly divine destinations, especially in the summer. Thanks for reading and commenting. It truly means a lot to me. And I checked out your blog. There are some really impressive stuff. It’s so nice meeting you.